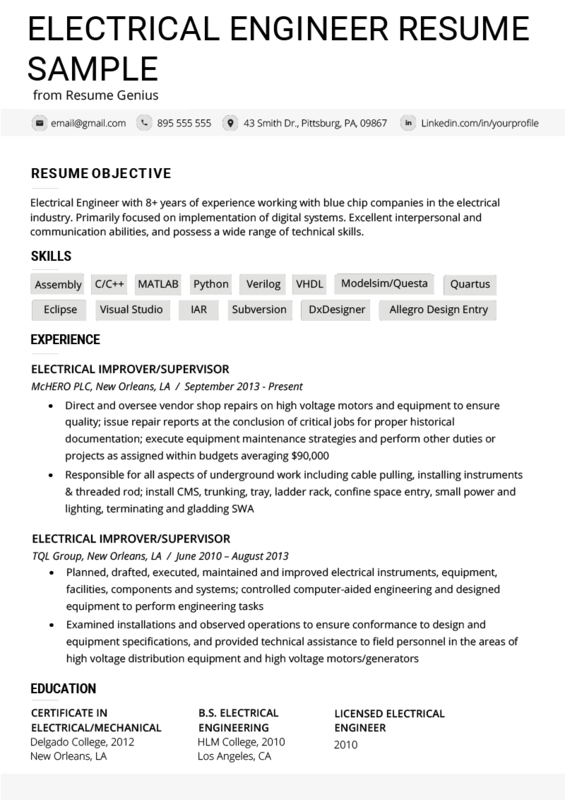 Amplify your career with our free, downloadable electrical engineer resume sample, or our convenient resume builder. Write your own by utilizing our resume writing tips section—drafted by industry professionals. 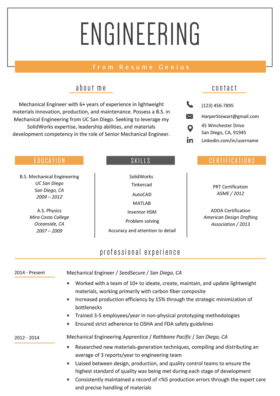 Electrical Engineer with 7+ years of experience working with blue chip companies in the electrical industry. Primarily focused on implementation of digital systems. Excellent interpersonal and communication abilities, and possess a wide range of technical skills. Enjoys being part of a team, as well as managing, motivating and training a productive team, and thrives in high pressure and challenging working environments. Planned, drafted, executed, maintained and improved electrical instruments, equipment, facilities, components and systems; controlled computer-aided engineering and designed equipment to perform engineering tasks. Because the general practice of electronic engineering requires you to be a “jack of all trades”, the resume tips on this page will be relevant regardless of what your specialization is.Utilizing these tips correctly should increase your chances of landing an engineering job earning an annual average of $87,920. You can improve your resume by quantifying your job responsibilities. 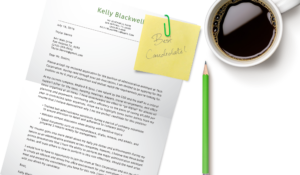 Here are three areas where the candidate used quantification to make their electrical engineer resume more effective and impressive to a hiring manager. Quantification is especially effective if you can demonstrate the amount of money you saved via negotiation skills, smart use of resources, discovering a new source of cheap materials, or developing new strategies to improve labor efficiency. Target your bullet points at the job you’re applying for. Do not write them as general, everyday job duties. What do we mean by this? When you read the job description for the electrical job you’re applying for, that is simply a list of generic job duties. Your resume must show the hiring manger that you can not only do those jobs, but that you’ve achieved important milestones while doing them in your previous work experience. Promptness, efficiency, and a sense of time urgency are important qualities to convey in a resume, and are considered achievements. Electrical engineers need to know a lot of technology and software to accomplish various tasks. These are known as “hard skills”, because they require knowledge and training. “Soft skills” such as communication and management abilities are also important to include on a resume, but should be communicated through your achievements in your Professional Experience section. Because the electrical engineering profession requires such a heavy amount of technical and software knowledge, it’s smart to list the tools and software you know how to use in your Skills section at the end of you resume. The more skill keywords that you include in your resume, the higher the chances that you will get interviewed. Companies that hire electrical engineers often use Applicant Tracking Systems to filter out candidates. These pieces of software can actually read your resume, and will judge your merit based on the number of keywords and key phrases that your resume contains. Therefore, the more skill keywords that you include in your resume, the higher the chances that you will get interviewed. Don’t be tempted to lie, however. If you don’t know how to do what you claim you can, you’ll eventually be found out.